Not bad for buyers, either, and plenty of them had turned up early for the Sure-Sell section at auction today. If you think about it, this is the way private sales have to go. As long as the vendor gets a decent price for his motor, he avoids the cost of advertising, he avoids fending off charlatans trying to flog him expensive ‘we have a buyer’ services, he doesn’t have to deal with phone calls from weirdoes late at night, he doesn’t have to wait in for prospective buyers who never turn up, he doesn’t have to risk undesirables arriving on his doorstep, he doesn’t have to take the considerable risk of allowing them to ‘test-drive’ his car, and he doesn’t have to sit on a pile of grubby Nelsons all weekend worrying that the buyer’s mates might come back and nick it before he can put it in the bank. There was some doubt about the mileage of the first car, a 2000W, so it didn’t sell. 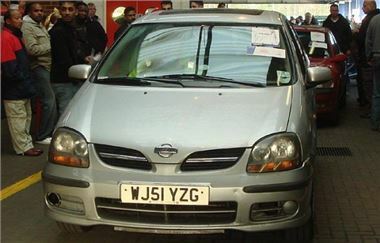 The next, an ex-taxi Almera Tino showing 111k but could have been to the moon and back was reserved at £1,200 and sold for £1,575. After that, a filthy 148k mile Vectra made £350, though would probably have seen £500 after a clean. A 116k mile 2001X A3 1.8SE sold for a solid £2,600, and so it went on with an unwarranted mileage 98S Golf 1.4S making £2,025 and a Group 1 insurance by 71k mile 2001X Lupo 1.0E selling for a huge £1,400. In comparison, a 46k mile 98S Xsara 1.6LX with MoT and drive home tax was a real bargain at £475. But the main point about Sure Sell is that vendors are finding buyers without having to actually meet them. And getting as much if not more than they would have done selling from home. Here’s the full list in order of the sale. As usual, ‘s’ means sold. ‘p’ means top provisional bid, ‘n/s’ means not sold. ‘n/w’ means miles not warranted. ‘MNW’ means unknown mileage. ‘dmg’ means damaged. ‘fl’ means facelift. ‘s/r’ means sunroof. Prime Fleet, Leaseplan, Sytner p/x, Lex, CarGiant, Jardine p/x, Black Horse, Inchcape p/x, Snows Group p/x, Trident Honda p/x.